While no homeowner likely looks forward to cleaning out their home’s gutters, it’s important to understand why this is a necessary task. Depending on your home’s lot, you should schedule at least 2 gutter cleanings a year, one in late spring and the other in late summer or early fall. If you have lots of pine trees over your roof, or large oak trees as many homeowners do in Ocala and the surrounding area, it may involve additional gutter cleanings. How Can Clogged Gutters Cause Harm to Your Property? Your homes gutters primary purpose is to divert water from your roof to an area away from the building that offers good drainage. Over time gutters will get clogged from shingle debris, pine straw, leaves and other debris. This debris will prevent the normal flow of water through the gutter and drain system to a drainage area. The result will be water collecting in the gutters and overflowing on to the building and foundation. This can eventually lead to erosion of the soil around the foundation leading to foundation cracks. Overflow of water from your gutters to the wood fascia and soffit boards will lead to wood rot. This wood rot can spread to adjacent areas such as an attic, allowing an easy entry for pests and rodents. Over time, this will also lead to sagging gutters as the fasteners holding the gutter to your house will come loose from the weight of soggy debris. Leaving your gutters unattended can lead to unnecessary and expensive repairs. Water build up in gutters can lead to roof leaks that can penetrate the walls of your home. The moist environment is a desirable habitat for most insects. As the weather changes this may lead to insects migrating to the inside of your home. In the case of termites and carpenter ants, both wood eating insects that love a moist habitat, infestations can cost thousands to eliminate and repair damage. 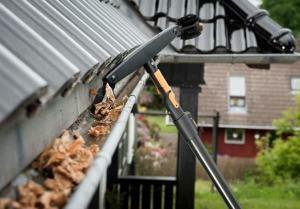 If you decide to clean your gutters yourself, make sure you have a reliable extension ladder. Wear long sleeves and a good pair of gloves. Use a trowel or scooper to remove the debris and place it in a plastic bag or drop to a tarp on the ground. While cleaning your gutters you should also inspect the condition of the fascia and soffit for any signs of wood rot. It’s best to deal with the problem up front as putting it off may just create more costly repairs. After cleaning the debris from the gutters, use a garden hose to flush out any remaining debris and insure that your down spouts are functioning properly. As with any home project, especially one that involves being high on a ladder, use caution and follow safety procedures. If you are unsure or not capable of handling the job yourself, it’s best to hire a professional. It’s a worthwhile expenditure that can save you thousands in the long run if neglected. Bowles Roofing is your trusted friend in the roofing business in Ocala and the surrounding area. With over 28 years’ experience, and an A+ rating from the BBB, you can count on Bowles Roofing to provide the highest quality roof repair or replacement services for both residential and commercial roofing of all types, including shingles, flat roofs, metal and tile roofs. We hope you never experience an emergency that requires our services, but if you should, make Bowles Roofing your first call!